Interesting character, Proteus. Son of Neptune – Greek God of the sea – his speciality was shape-changing, morphing into any form he chose – a leopard, a tree, some water. It’s a neat trick and one that inspired Carl Linnaeus – father of taxonomy – to name a family of wildly different-looking plants after him: Proteaceae. 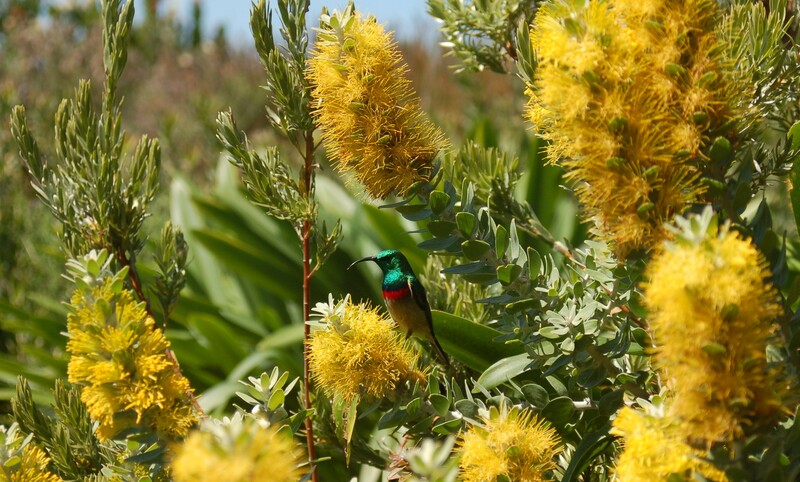 A common sight in fynbos: a sunbird feeding from the flowers of a protea – in this case, a type of Mimetes or Pagoda Bush. But that wasn’t even 300 years ago. Proteas have been around for a couple of hundred million years. Evolving alongside and eventually out-living the dinosaurs, they spread across Gondwana – the primal southern super-continent – and can now be found in places as diverse as South America, Madagascar and south-east Asia. But it is Africa’s proteas that are so extravagant in flower and form. Tree-like types occur in Africa’s savannahs but over 90% of the continent’s proteas are confined to the south-western Cape – Realm of the Fynbos. The pine cone-like fruits of the Leucadendrons give these proteas their common name of Cone Bushes. I’d better quickly explain the term ‘protea’. The family is Proteaceae; Protea is one of the genera within the family. (Another example: dogs are in the family Canidae, their genus is Canis.) 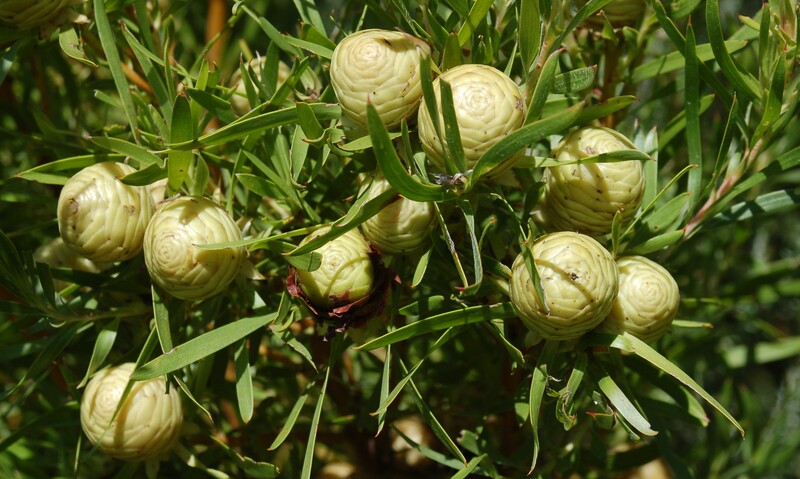 Other genera in Proteaceae may be familiar to you: Leucadendron – the Cone Bushes; Leucospermum – the Pin Cushions; while the Protea genus itself contains the most famous species: Protea cynaroides – the King Protea and Protea repens – the Sugar Bush. But the pleasant familiarity of the word ‘protea’ has come to mean that all species in Proteaceae are casually referred to as proteas. Which is fine with me but it may get academics agitated so here I shall use ‘protea’ to describe the family members in general, and ‘Protea’ for the genus: Protea nitida is a protea and so are Orothamnus zeyheri and Leucospermum hypophyllocarpodendron. 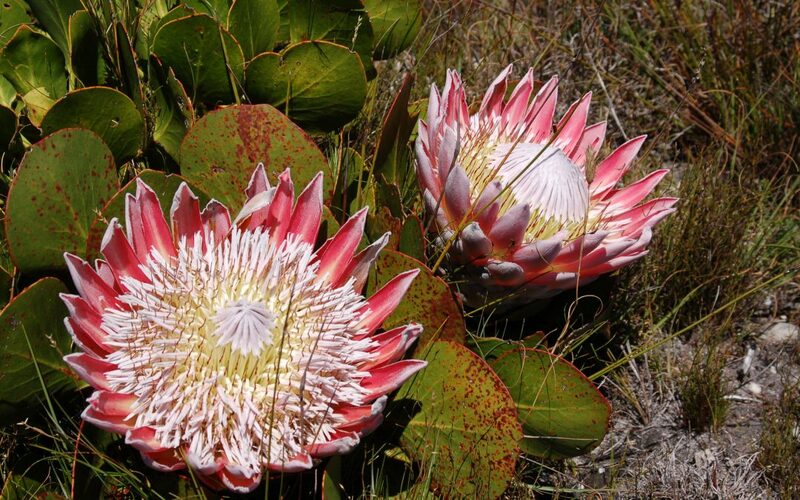 Protea repens – the Sugar Bush – was once the Cape’s main source of sugar to sweeten both hot drinks & foul medicines. Whichever genus, proteas are impossible to ignore. Without them, fynbos would be drab and fiddly-small; with them, the Cape’s mountains explode with colour and scale from individual bombs of beauty such as the King Protea to great sheets of luminous yellow Cone Bushes. 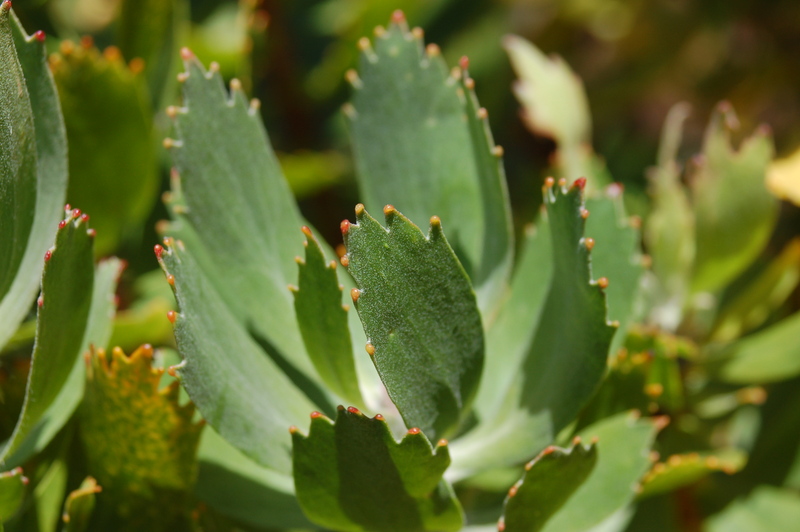 Proteas can be large trees – eventually forming a forest-type habitat – or they can be creeping ground covers. They grow in dry places, rocky places and wet places, and may be common across the region or restricted to a remote, ten-mile twist of coastline. Proteas bring wildlife into the fynbos. 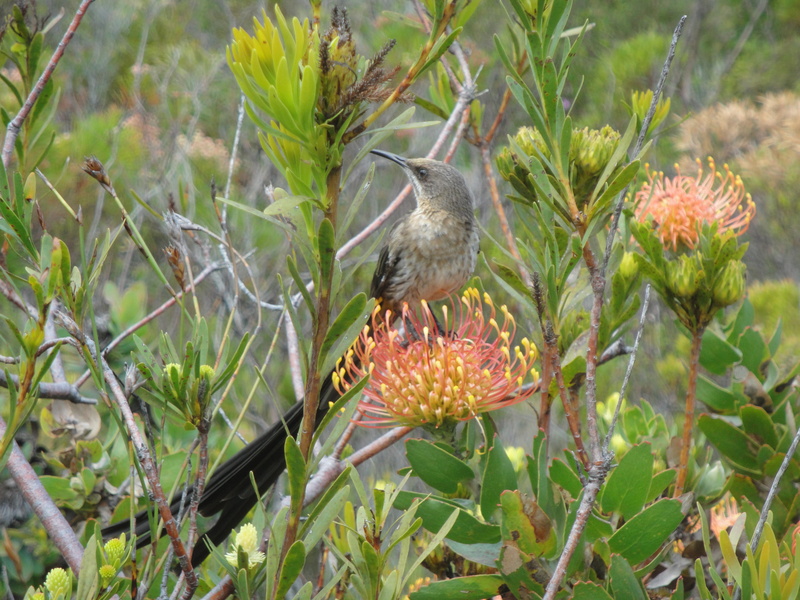 Sunbirds and sugarbirds feed off their nectar while a single King Protea flower head may contain dozens of different insect species. Baboons nibble protea seeds; finger-thick caterpillars munch their leaves; and aerial hunters like flycatchers, dragonflies and shrikes use them as perches. Cape Sugarbirds can be found wherever proteas are in flower & flowing with nectar: this is a Pin Cushion, a Leucospermum. It hasn’t been plain sailing all the way, however. Proteas have had to get used to fire, an ever-present factor in the Cape’s dry, sunny and windy mountains. They do so by being either a re-sprouter (growing back from a protected root-stock or resilient stump) or by being a re-seeder. Dormant growing buds lie under the thick, flame-proof bark of a Wagon Tree – Protea nitida & are stung into life by the chemicals in fire. 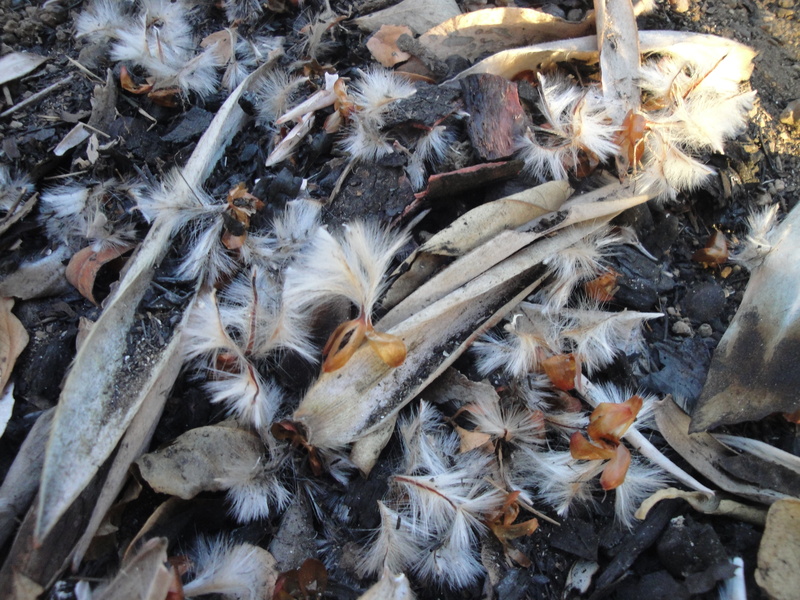 Some re-seeding proteas – Leucospermums and Serrurias – drop their seeds before a fire. These are at risk from predators – mice, canaries and insects – but each seed comes with an edible attachment – an elaiosome – which attracts foraging ants. The obliging ants carry the seed down into their underground nest, eat the elaiosome but leave the seed intact. Now the seed has a nice warm, dark and safe place to lie dormant until the heat from a fire propels it into germination. 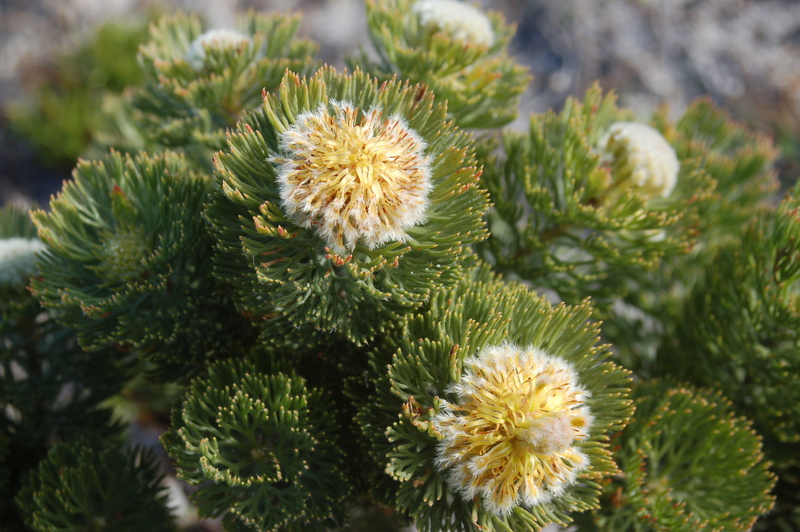 The technique is called myrmecochory and about 30% of fynbos plants use it for seed dispersal. Serrurias are strange-looking proteas that use ants to disperse their seed: this is Serruria villosa, the Golden Spiderhead – found only south of Cape Town. 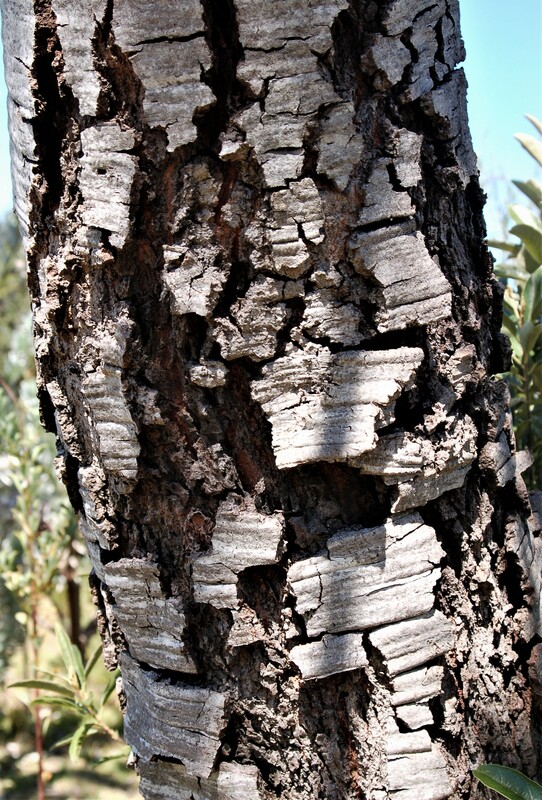 Other re-seeders – the Sugar Bushes for example – release their seeds in great masses immediately after a fire. Gusting through the air on a parachute of fine hairs, the seeds pile up like snowdrifts and begin burrowing underground: the seed’s hairs open in hot weather and close in cooler conditions so the seed can, amazingly, ratchet itself into the soil. Ejected from their hard seed cases after a fire, millions of protea seeds cover the ground & provide food for the fire’s survivors. Needless to say, proteas have occupied an important part of human history in the Cape. We once made sugar from their nectar and ink from their leaves. We cured leather with tannins extracted from their bark and fashioned wagon parts from their timber. We beat out fires with them and wove them into South Africa’s first security fence (still visible at Kirstenbosch Botanical Gardens). And you try walking into a Cape Town hotel without seeing a vase of the things: they are everywhere. The toothed leaves of a Pin Cushion are actually sugar dispensing glands, encouraging sweet-toothed ants to take up residence & drive away potential predators. It’s a shame then that so many proteas are in calamitous decline. 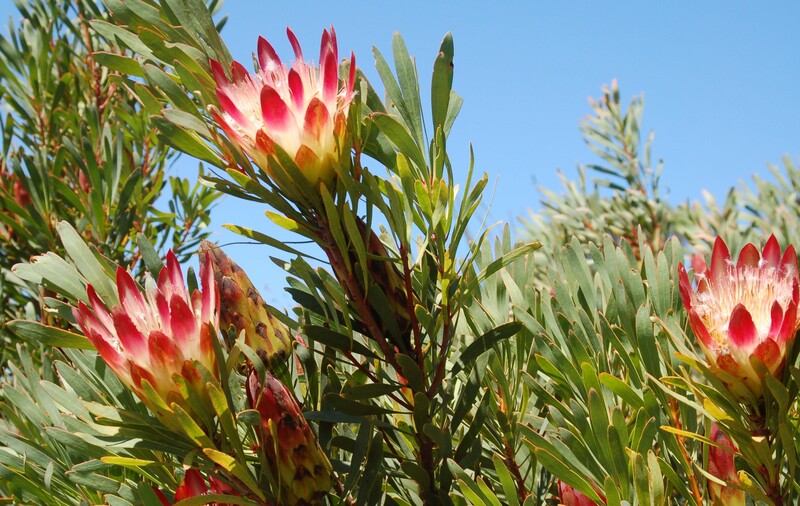 The rise of commercial protea farms has rid the mountains of the traditional scourge of over-picking but the relentless creep of alien vegetation and man-made fires threaten the Cape’s proteas at every turn. Slow-growing proteas simply can’t compete with the lightning-bolt growth of smothering pines and eucalypts while the increasing frequency of fires prevents many proteas from even producing seed. Proteas have been around since the days of Triceratops and Tyrannosaurus rex. They’ve conquered every habitat here from salt-sprayed beaches to snow-capped peaks; they are on the South African coat of arms and are the emblem – and nickname – of the national cricket team; they have specific names like magnifica, grandiflorum and conocarpodendron subsp conocarpodendron and common names like Blushing Bride, Crippled Tree and Louis Leipoldt’s Spiderhead. It’d be a shame to lose them: they are, after all, the flowers of the Gods. We saw the Golden Spiderhead blooming above Simon’s Town last year. Yes, it’s a good place for them there. Also at Silvermine (eastern side) and the Good Hope Reserve.